Can drinking a crisp, sweet and refreshing glass of white zinfandel be too good to be true? Researchers are developing and presenting studies to determine whether white zinfandel is a healthy wine to drink. Most research supports drinking red wine to reduce the risk of heart disease. White wine may also share many of the same benefits. However, drinking too much alcohol has been associated with serious health consequences. Be sure to ask your doctor if it is safe for you to drink alcohol. Before pouring yourself a glass of wine, you should understand how much wine is in one serving. One serving of wine is widely considered to be 4 ounces or about half a cup. The amount of alcohol in 4 ounces of wine equals 12 ounces of beer and 1.5 ounces of 80-proof liquor. Women should have no more than one serving per day and men no more than two. White zinfandel is quite calorie dense. According to SutterHome.com, 5 ounces of wine contains 108 calories per serving. In comparison, 4 ounces of Coca-Cola contains 85 calories. Because there are 3,500 calories in a pound of fat, it would take five weeks for you to gain 1 pound of fat if you introduced a serving of white zinfandel into your daily diet. If you are trying to lose weight, the increased caloric intake may be significant. However, if you are satisfied with your weight and exercise regularly, one serving per day should not result in weight gain. Moderate alcohol consumption has been linked to heart health. 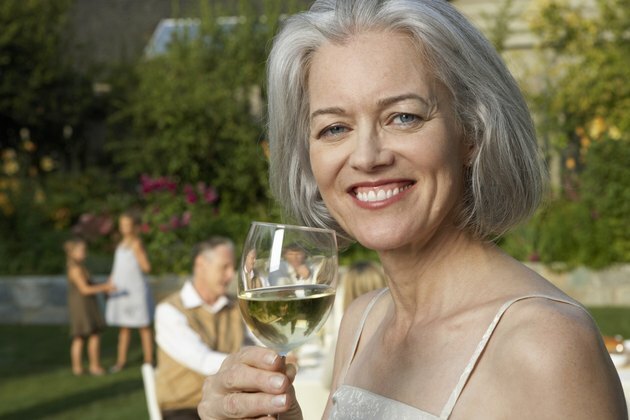 Specifically, wine can raise your high density lipoprotein cholesterol, or HDL. HDL cholesterol removes plaques from your arteries that can increase your risk for heart disease and stroke. While beneficial, other foods, such as fruits and vegetables, have been shown to have a better effect on increasing HDL without the risks of drinking alcohol. White zinfandel has 8.3 grams of carbohydrates in each 4-ounce serving, which is significantly less than the 23 grams of carbohydrates in Coca-Cola. Carbohydrates are molecules that are broken down into glucose in the digestive tract. Glucose is absorbed into the bloodstream and provides energy to your cells and tissues. If you are losing weight or have diabetes, consuming carbohydrates in a beverages may lead to weight gain and poor blood sugar control. Regularly check your weight and blood sugar to make sure white zinfandel is not negatively affecting your health.